A certain value developed by a chef for the chefs! Dashi Bouillon to infuse : 33% of kombu royal, bonito, miso paste, soy sauce, Shiitake mushroom. Thaï Bouillon to infuse: 80 % of chicken meat, lemongrass, vegetables (ginger, onion, celery, carrot, garlic), curry paste, galanga and some keffir leaves. Chicken Bouillon to infuse: 83 % of chicken meat and juice. 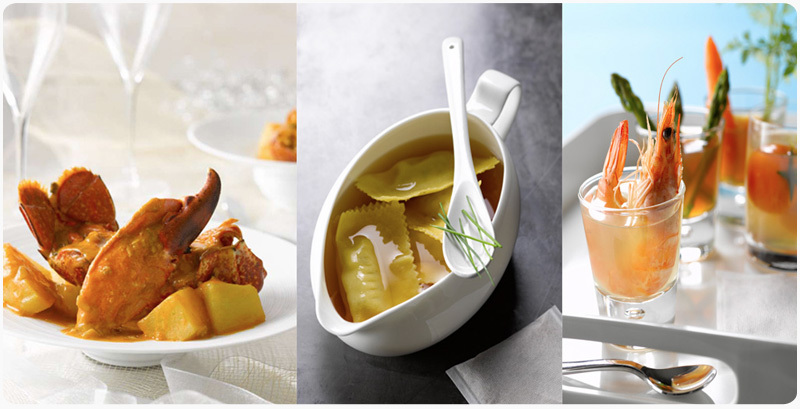 Clam Bouillon to infuse: 52 % of shellfish meat and juice. Beef Bouillon to infuse: 71 % of beef extract and juice. Vegetables Bouillon to infuse: 80 % of vegetables (celery, mushroom, carrot, tomato, onion, leek). Shellfish Bouillon to infuse: 53% of shellfish (langoustine extract, shrimp meat). A box of 5 sachets, 1 sachet = 2 litres of bouillon / A box of 5 sachets, 1 sachet = 33 cl of bouillon (individual sachet is ideal for the catering, the room service, the take-away business,…). 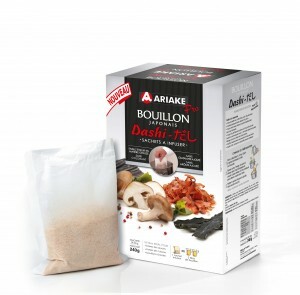 Dashi bouillon : a box of 4 sachets.